Before we came the team had many meetings about the projects we were going to do while in Uganda and one of them, which was the one I was most exited about, was planning a primary school. Once we got there the project turned into painting all the buildings on campus. And yeah that doesn't sound very exiting but it was so fun and ended up being so rewarding that I'm glad that’s what it became. When we first arrived the place was in terrible shape. It almost looked abandoned because of how rundown it was. So we started on the outside with a base coat. Once we got that finished on the first two buildings we thought the project was going to go so fast, but the real work started. The class rooms on the second building had to be painted with a base coat so that they could be painted green and cream colored. After that the artist of the group Suzan Bengard started drawing out the animals and picking out colors for the nursery. While some of the group was working on the art in the class rooms the others were working on the final outside coat of yellow which took about five days. The fifth and sixth day we painted the third building the same yellow as the first two and we thought the only thing left was that last two class rooms and the art in the nursery, but on the seventh day we started and finished painting the girls and boys dorms. It wasn't all easy peasy. It was long days in the burning sun or pouring rain and there were quite a lot of mess-ups, but in the end, we were all really happy and proud of the work we did. 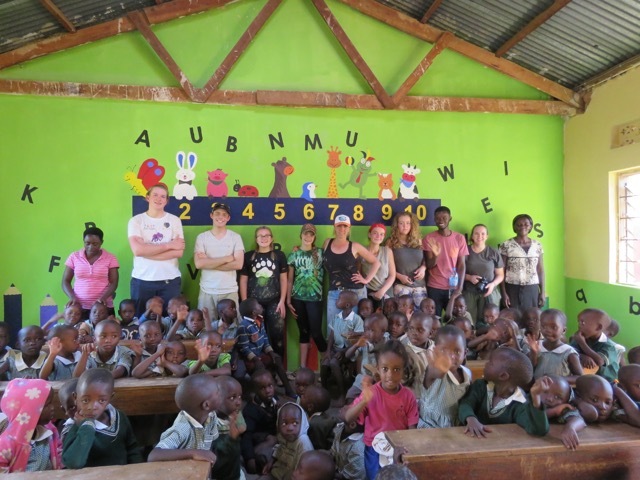 The last day we brought the little, little kids into the nursery that Suzan painted the animals and numbers in and the looks on their faces along with all the exited giggles was all the payment we needed. I would gladly do it all again just to see that reaction. I could not be more proud of the team we have here with us and the work we have done.